A worrying feature in customer service chats has been discovered and it has many users concerned about their privacy. A growing number of live chat services, which are often used to connect customer service representatives with users in need of help, have been found to be equipped with 'real-time typing view,' according to Gizmodo. This lets customer service representatives see what you're typing even before you send it. While many claim the feature is meant to help customer service reps prepare an answer to your question ahead of time, it's unclear if users are aware of the tool. The issue came to light after Gizmodo received a screenshot from a reader, wherein they bluntly asked a representative in a live chat whether they could see their messages before they were sent. The live chat was with a representative from a mattress company. 'Can you see the messages I'm typing before I send them?,' the user asked. In another example, news site Hmm Daily described a case where a company provided a detailed recommendation for a product a mere second after the user sent their question. 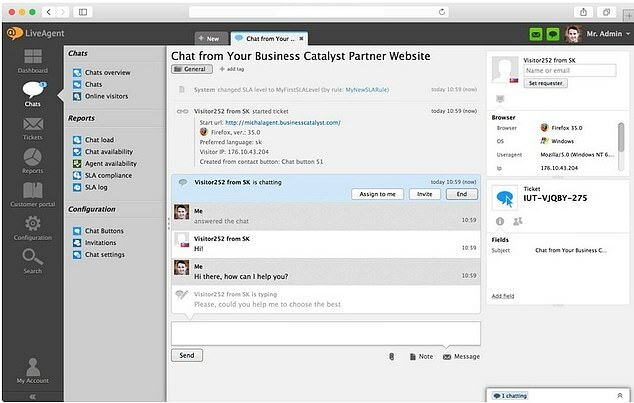 'View what your customers are typing on Live chat in real-time,' a service called Live Agent notes on its website. 'Have your answers prepared before the customer submits his questions. 'Before the customer clicks the "Send message" button, you have a chance to see in real time what the customer is typing. 'This gives you more time to prepare an answer or solution to the customer's problem. Customers will appreciate your quick and precise answers,' it continues. However, as it turns out, not all customers appreciate their messages covertly being read as they re-phrase them or decide not to send them at all. There are other services that offer this feature, such as Live Chat, which has a 'message sneak peek' tool, according to Gizmodo. Live Chat counts McDonalds, Ikea and PayPal as a few of its customers. As if that wasn't creepy enough, some services also offer people the ability to see what webpages their customer has open and receive notifications of every webpage they open, Hmm Daily said. Users should be wary of other customer service interactions as well, Gizmodo noted, as many are unaware that calls recorded for 'quality assurance purposes' often include any audio when customers are on hold, which can include anything from private conversations with your family members to you talking to your pet. Many pointed out that the services could somewhat alleviate privacy concerns if they simply notified users that customer service representatives see what they're typing before they send it. To notify users, it could be as simple as including a disclaimer or button on the chat window that warns of the feature. The feature brings to mind the user data mishaps experienced by Facebook, Google and the like. While the tools are meant to improve the user experience, they end up paying little attention to their privacy - a phenomenon that has become all too common in Silicon Valley, Hmm Daily noted.